My days in Iceland were absolutely incredible!! Leaving the island was sweet and sour feeling for me. I loved every second and although I was nearly broke after only 4 days, I'd go back anytime. But the sour feeling came from the fact that there was so much left to see. I needed more time. Browsing on Instagram you're gonna see fantastic shots of Iceland. That place is really something else. I remember feeling “I want to have amazing experiences like these people on Instagram are having”. That was my mindset for my Icelander endeavor. One of the spotlights of this winter trip (Feb, 2017) was visiting the famous Seljalandsfoss waterfall. One of Iceland's most seen attractions and indeed a wonder. But as great as it was to see that incredible and powerful waterfall, my special travel moment happened just 100 meters walking from there. 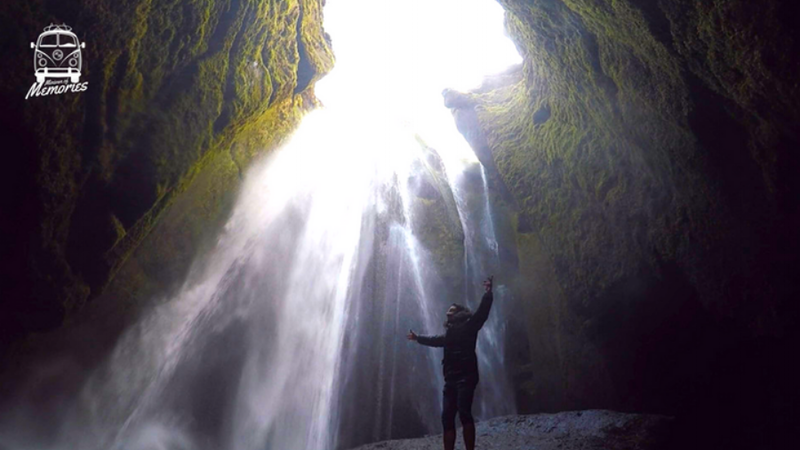 After being soaked wet after our excursion behind the angry and cold waters of Seljalandsfoss, my friend Marilia and I decided to explore the surroundings and we ended up discovering a “secret” waterfall. It was hidden by a giant wall and we could only see it through a not so large crack. To reach the waterfall you'd need special waterproof shoes, since you'd have to emerge your feet into the cold water and walk through the gap on the wall leading to the hall where the water falls majestically. My instant reaction was “I wish I had brought proper shoes”. Defeated, I turned around and started walking back towards our car, when it hits me: if special and unique moments is what I'm looking for, I should act careless and just go for it. I head back to the waterfall's great wall, take off my shoes and start walk through the gap, bare feet, into the freezing water in a 6 degrees temperature day. I was already wet from exploring Seljalandsfoss and the warmth was already leaving my body. And the path was torturous. My feet were as cold as ice and the little rocks were like needles poking me every step. I had my GoPro with me on all the time and it captured me doing super ugly faces every time I stepped on something sharp. All that pain to have one of the most rewarding travel experiences I've ever had. I was the only person in there. The gap wasn't very large, the power of the water hitting the ground was creating this cold, wet and overpowering wind. When I look up I could see exactly the beginning of it in an almost perfect round circle. In this popular destination where everywhere is crowed with hundreds of tourists the feeling of being there alone was priceless. I set my GoPro on a stand and got on this huge rock, carefully put there to bless brave tourists with the most spectacular photos. I finally breathe calmly for the first time and had a good look around to soak in this spectacular moment. Some of you probably saw that moment happen on Instagram stories. I stayed there for nearly 10 min. The cold was draining the strength from my legs and I still had to walk over that painful path on the way back. But cherish every single moment of it. For the travelers out there, don't be afraid to explore, take chances and challenge yourself. Sometimes out of shyness, fear or even laziness we miss out incredible experiences the world has to offer. Taste new food, try new languages and jump into unexpected adventures and the reward will be endless. But do it with responsibility.